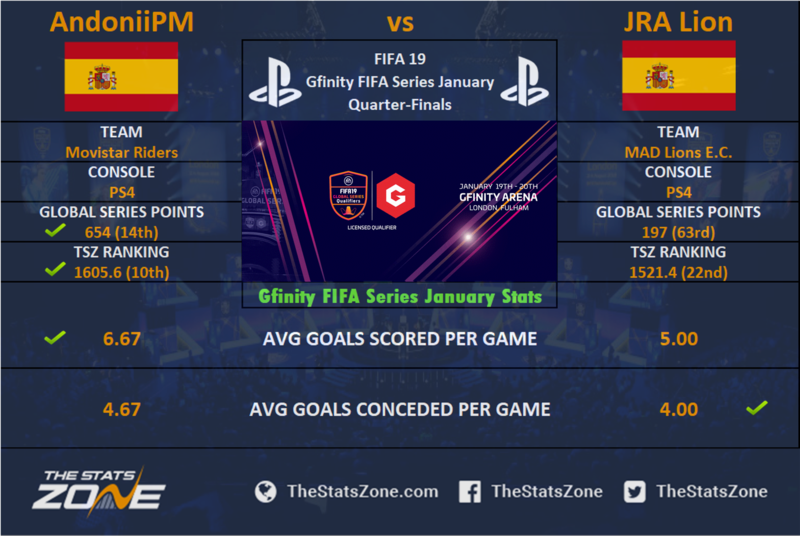 Today sees the conclusion of the Gfinity FUT Champions Cup at the Gfinity Arena in London. A total of 16 players remain in the tournament and will battle it out for a first-place prize of $8,750 and 850 Global Series Points. In this preview we take a look at the eight console quarter-final matches and predict the results of each contest. The first Xbox One quarter-final sees SK Gaming’s DullenMIKE take on Schalke's S04 Tim Latka. Mike swept through the group stages with a perfect 3-0 record. His fellow countryman finished with a 3-2 record and needed a 5-3 win over Marcus Gomes to guarantee his spot in the quarter-finals. 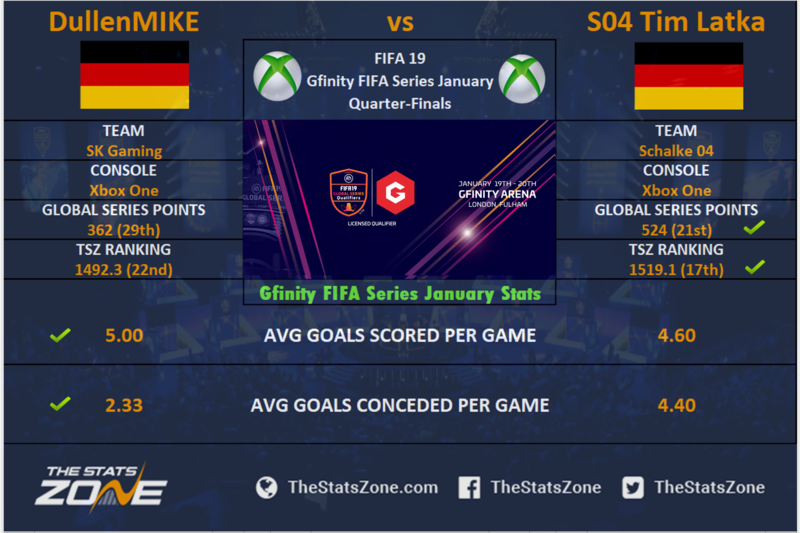 Despite Mike performing far better than Latka in the group stages, this is a tough game to call as Latka had the higher seed coming into the tournament, proving that he could very easily take the win if he plays well. However, these two faced each other in the groups it was “DullenMIKE” who was a comfortable 7-3 winner. We’re predicting the SK man to do so again in the knockout stages. 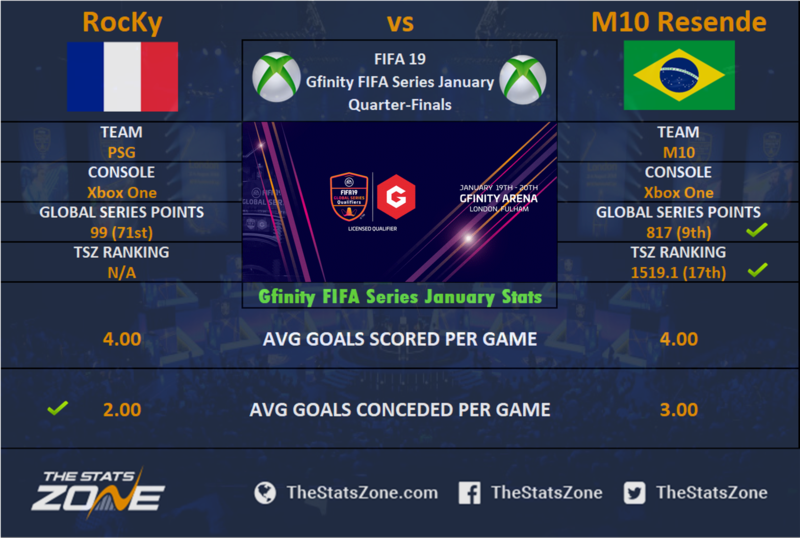 Our second Xbox One quarter-final pits Paris Saint-Germain’s RocKy against M10 eSports’ M10 Resende. After losing his first two matches on penalties, RocKy stormed back to win his next three games to qualify. He plays 4th seed Resende, who qualified in round four of the group stages, scoring 15 goals overall in his three wins. It’s France vs Brazil in this clash between the FIFA 18 ESWC Sao Paulo winner and the former two-time French champion RocKy, who is making his return to the offline stage for the first time on FIFA 19. We believe that that lack of FIFA 19 offline experience could count against him and are therefore tipping “M10 Resende” to win out here. 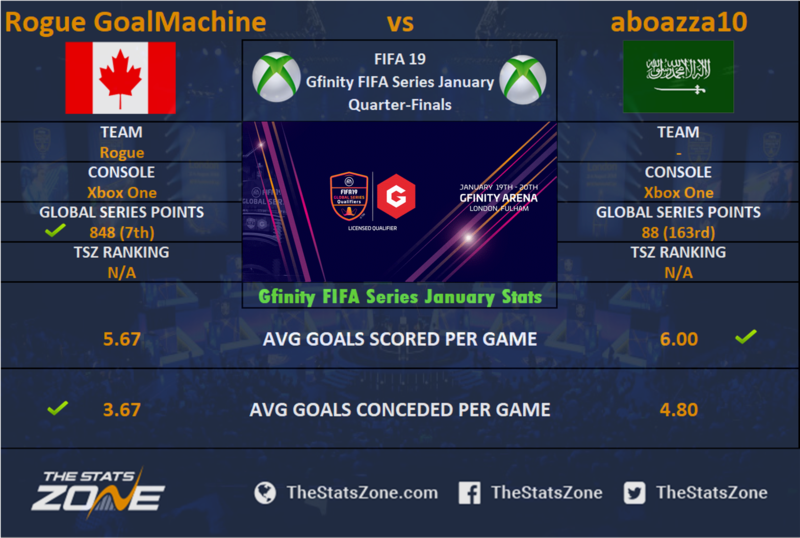 Our third Xbox quarter-final sees Rogue GoalMachine of Rogue eSports face off against aboazza10. These two players have already faced off in the group stages, and it was an incredibly tight game which saw the Canadian win out for Rogue in a 7-6 thriller. He’ll be hoping for a similar result today. 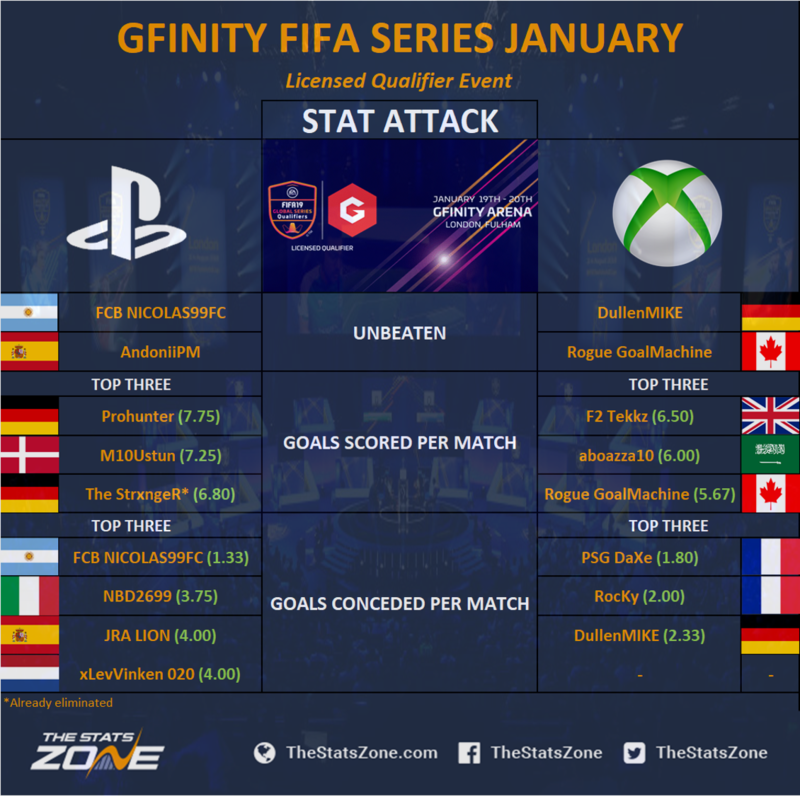 But aboazza10 proved his worth in the group stages, non more so than in the first round of games when he pulled off a stunning 6-3 win over F2Tekkz. On paper this is a mismatch with the 3rd seed from Rogue taking on the tournament's bottom seed on Xbox One. However, their group game was anything but and it could be a similar story here. "Rogue GoalMachine" will be well aware of the Saudi’s threat by now and as long as any complacency is avoided, the Canadian should progress to the semi-finals. Our fourth and final Xbox One quarter-final is a mouthwatering clash between number one seed F2Tekkz and the second quarter-finalist of the tournament from Paris St-Germain - PSG DaXe. It was a shaky start for Tekkz - winner of the most recent LQE - after he lost his first game to alboazza10. However, the two-time FIFA 19 trophy winner bounced back to qualify for the knockouts by winning his next three games, scoring a whopping 23 goals in the process. He faces an FIFA 18 ESWC champion who, despite losing two games in the group stages, has the game to cause an upset against the 17-year-old. 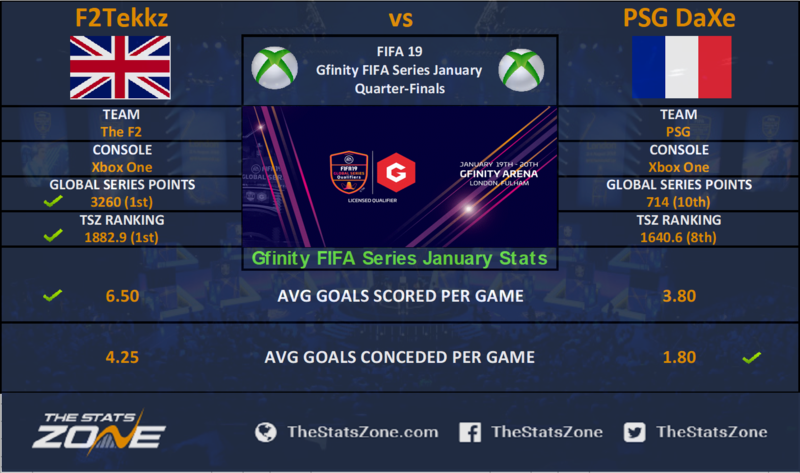 PSG DaXe is certainly not the easiest opponent for the PGL Cup and FUT Champions Cup Bucharest winner and if “F2Tekkz” starts against the Frenchman the way he did in his first group game, then it will lead to a shock elimination. But the pre-tournament favourite isn’t considered the best FIFA 19 player in the world for nothing and we expect him to show it in this clash. Our first PS4 quarter-final sees a big South American match-up as Argentina takes on Brazil. FUT Champions Cup Bucharest runner-up FCB NICOLAS99FC has arguably been the most impressive player of the tournament so far, winning all three of his games whilst conceding only four goals! He plays WolvesFifilza who caused a big shock in the fifth round of group games, beating MoAuba 6-5 in a thrilling elimination playoff. It’s a battle between the 1st seed and the 12th seed on PS4 in this quarter-final. 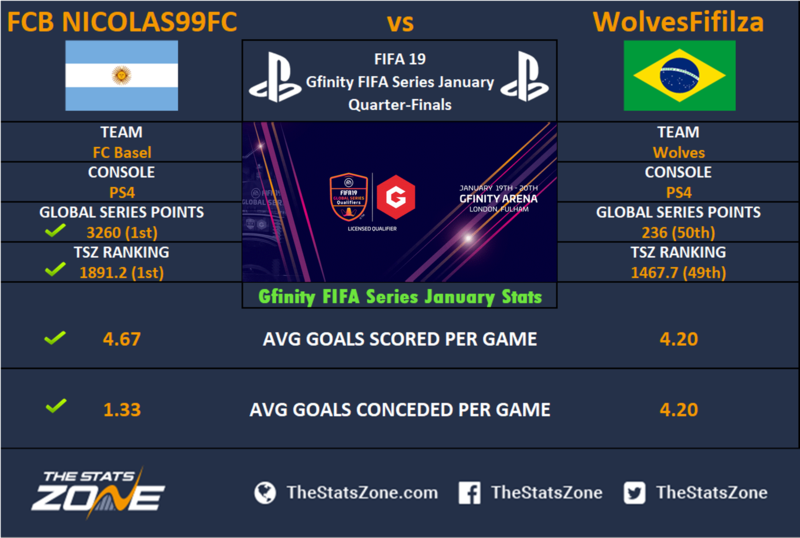 WolvesFifilza won’t make it easy for the FIFA 18 Global Series PS4 winner, but we predicted the FC Basel player to go all the way in this tournament and so far we’ve seen no reason to change that opinion. We’re tipping “FCB NICOLAS99fc” to win this one. The second PS4 quarter-final sees 2018 FIFA eClub World Cup winner M10Ustun face 10th seed Prohunter. 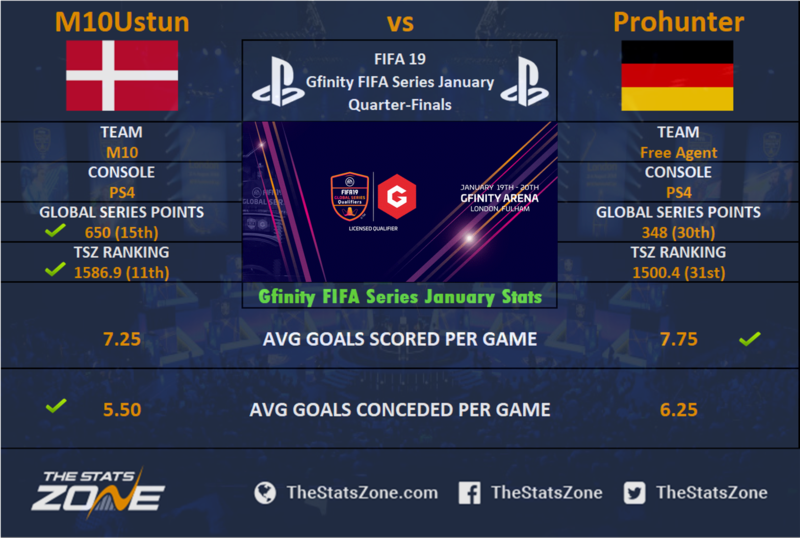 The second quarter-finalist who represents Arsenal footballer Mesut Ozil’s organisation, Ustun needed four rounds of group games to qualify for the knockout stages, whilst Prohunter needed penalties to beat JRA LION in round four and book this quarter-final tie. Yet another close game is anticipated here, with both players needing four games to secure qualification. They met each other in the first game of the group stages and played out a thrilling 8-8 draw, with the Dane winning on penalties. We’re predicting a glut of goals yet again, but also the same result with "M10Ustun” narrowly winning out. The third PS4 quarter-final features Movistar Riders’ AndoniiPM, who swept through the group stages with three wins from three. The Spaniard will play his fellow countryman JRA LION; The 13th seed won an elimination playoff in the fifth round of group games against NYC_Chris. AndoniiPM has been a stand-out player in the tournament so far and will hope to take his momentum into this quarter-final, but he won’t be as fresh as his opponent, who was the final player to qualify through the group stages. Scoring 25 goals so far including an impressive win over North Agge, we’re predicting a shock result and that “JRA LION” takes this momentum into this match and pulls off an upset win. The final PS4 quarter-final is between Italian NBD2699 face Dutchman xLevVinken020. Lev qualified for the quarter-final with a thrilling 7-6 win against TheStrxngeR in a fifth round elimination playoff. It was less stressful for NBD2699, who qualified in the fourth group round, beating NYC_Chris 4-3. Our final quarter-final prediction is like most others - tough to call. It’s the 9th seed vs 8th seed and we expect that fine margin to be replicated in this match. They faced off in the group stage with Lev winning 4-3, but he seemed to drop off in form as the groups went on, losing two games in a row before scraping through in his final match. On the other hand, “NBD2699” won his next three games following the defeat to secure his qualification. We think he has the winning momentum and can carry that on with a tight victory here.